I’ve had a secret project for the past few months. I’ve been making my own cheese. Yeah, that’s in addition to all the meat creation that’s been going on as a part of charcutepalooza. You’ve seen some of my homemade cheese already; the cream cheese under the salmon in the smoking post, the queso blanco in the stuffed peppers that were the center piece of my first sausage post, and the goat cheese in the stuffed turkey burgers. It’s too early to say if all this food-related DYI stuff is a mid-life crisis or a permanent direction change for me. If it’s a crisis least it’s a tasty crisis, and a lot less self-destructive than other courses I could have chosen. What the hell, right? And I’m learning a lot. I’m more than a little embarrassed to admit it, but this adventure started at Costco. Piled in with all the other cookbooks was Ricki Carroll’s Home Cheese Making. That was same week in February that I was re-reading Animal, Vegetable, Mineral, which not only mentions the book, but includes a description of a cheese-making seminar led by Carroll. I’ve got good sources for milk here in Boise, (I really was only in Costco for toilet paper. I swear.) And it sounded fun. Besides, after you’ve made your own duck prosciutto, it’s hard to be daunted by any culinary project. Carroll’s book is a gem. I’m not the first to think so –it’s been continually in print since 1982. I started with the paneer and have since made lemon cheese, Neufchatel, cream cheese (using the cooked curd method, ricotta, queso blanco, mozzarella, (I need more practice with that one), and one hard cheese, Guidos’s cheese, which looked accessible, even without a cheese press. I’ve had a few near misses and one heart breaking batch of goat cheese where all the curds washed through the cheese cloth, and down the sink, before I could stop it. But these stumbles were all user-errors, not the fault of the book. If you are even slightly interested, get a copy and give it a try. 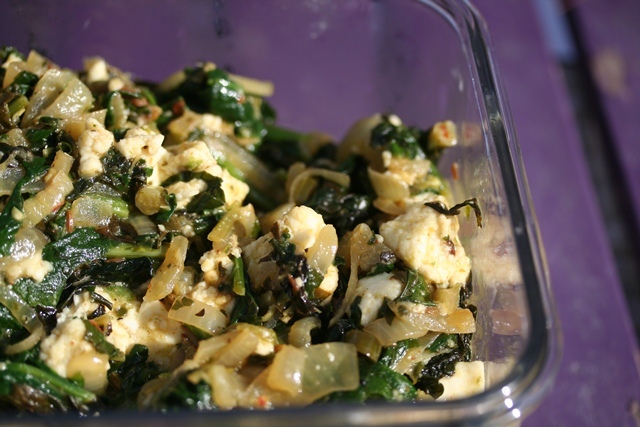 You can check out the recipes on Carroll’s website and the awesome gallery of cheese making posts at Punk Domestics, too. My favorite homemade cheese – which I’ve made once a month since that fateful trip to Costco is Carroll’s cooked curd cream cheese. It takes just 12 hours – and it is spectacular. Particularly when made with goat cheese. I can’t share the recipe here, since I haven’t adapted it or changed it in anyway, but trust me, it’s well worth the cost of the book. 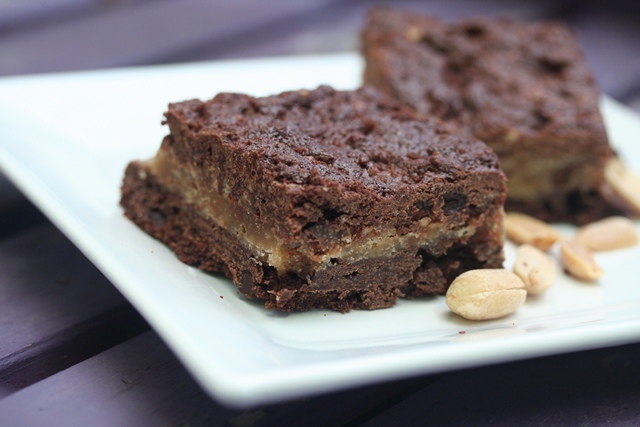 But I can share the recipe I developed just for this cream cheese – Peanut Butter Cream Cheese Brownies. If you’ve never tried goat cheese in a dessert, do it now. As for me, I’m ready to try hard cheese. And that requires a press – something that can be set to apply anywhere from 5 to 50 pounds of pressure to a cheese mold. Luckily for me, I’m not the only one in the house with a DYI bug. K.M. can build nearly anything. 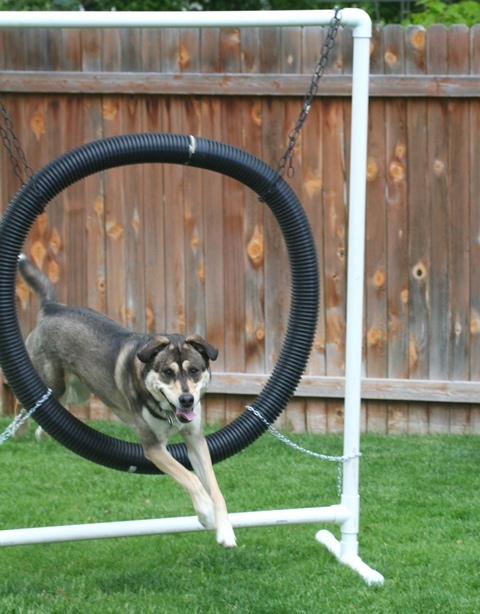 He’s made furniture, he designed and built a complete salt water aquarium ecosystem, he moves walls, and he runs wires, and he builds all Mishka’s backyard agility equipment, the later, just because asked – agility is my obsession, not his. His mechanical talent is pretty scary, actually. What’s even weirder is my Dad was exactly the same. I didn’t ask K.M. 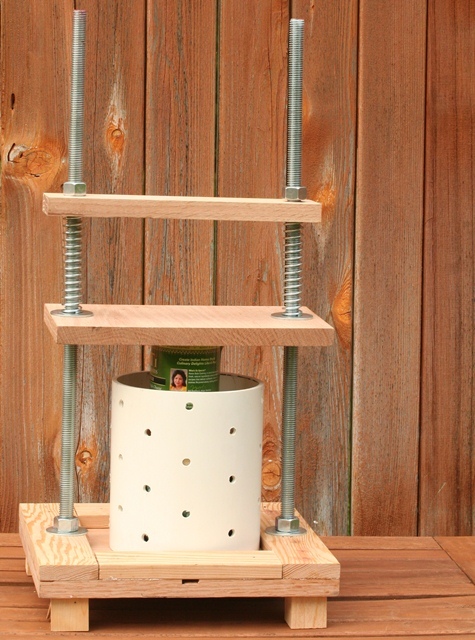 to build a cheese press. He simply decided to do it. Maybe the cheese has been that good. So I hope, anyway. On Sunday night he drew up a plan – and by the end of the holiday on Monday, he’d gotten this far. It still needs a little more work – right now, we’re missing a way to measure the pressure, but I’m pretty sure that’s in the works. 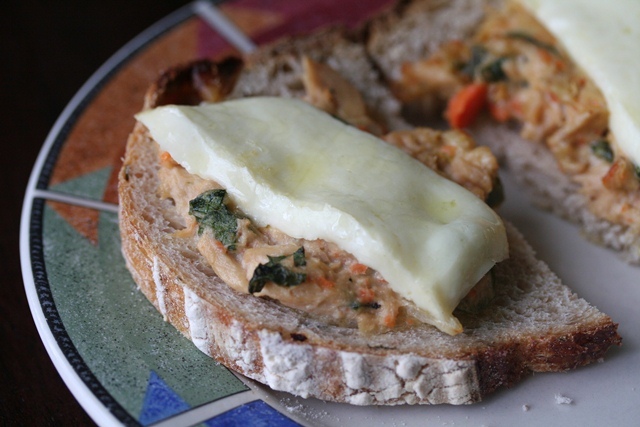 When it’s done, I’ll test it out with farmhouse cheddar – and I’ll upload the final design. Cross your fingers for me. This post is a fun read! Mid-life crisis or permanent direction change–love the way you put that. It captures what a lot of us wonder–hoping that the fun lasts but fearing we’ll lose the interest, time, or whatever else. The only home cheeses I’ve made are a (sort of) ricotta and queso fresco. I’d love to hear about your cheddar adventures. And thanks for the book tip–had been looking for a good source. Thanks, Kate. I hope we stick with it! 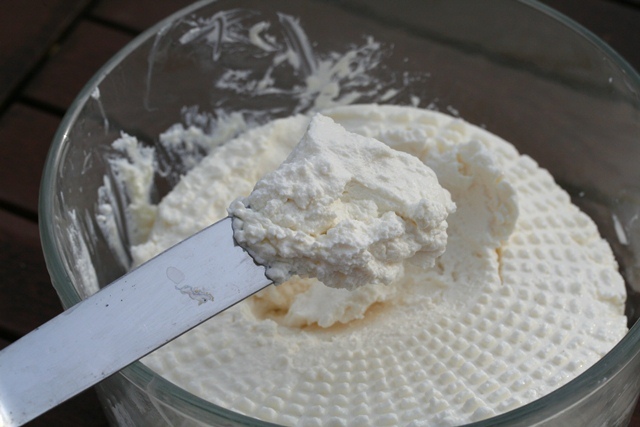 Traditional ricotta has been a real challenge for me, but there is a whole milk version in the book I’ve had great luck with. I’ll let you know how the cheddar goes! I, too, am a secret cheese maker. I started with Ricki’s book, then took a class and then … well you know. Anyway, I wanted to thank you for your information and express my appreciation for the delightful way you wrapped humor around your message — made for enjoyable reading. Thanks for the praise. I am still making cream cheese and chevre, but I haven’t done a hard cheese in a while, in spite of encouraging results last year. I’ve got to do that again. I’d love to take a cheesemaking class one day. I have a homemade cheese press too. I went to Walmart and bought free weights in 5lb, 10lb and 25lb increments. As many as I thought I would need for my fav recipes. Good luck! That is a great one the mid life crisis or permanant. I hope mine is permanant as I find it important to know where most of my food is coming from and what is in it. 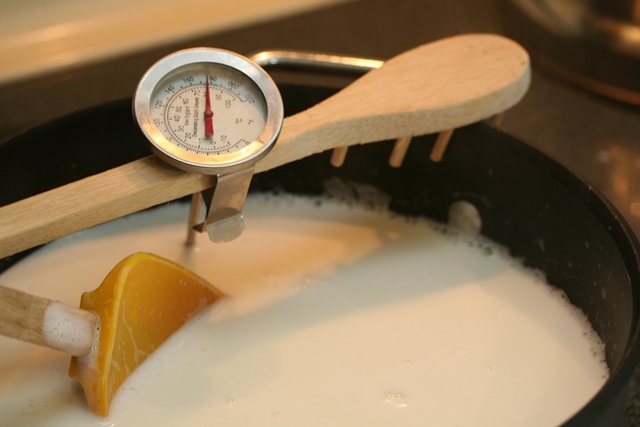 My cheesemaking is another step in that direction. I love Rikki’s book and everything I have purchased from them has been of great quality.